Two years later, the band is clearly trying to leave those bleary days behind with their new record, The Only Place, produced by industry big name Jon Brion, who’s worked with Kanye West and Fiona Apple. Cosentino has talked about wanting to move away from a low-fi sound towards something more grown-up, and the sound here is indeed a major departure—tidied up and slowed down. That’s not a problem in and of itself; there’s only so far you can take the two-minute-beach-song formula, and it’s nice to finally hear Cosentino’s voice coming through loud and clear. The problem is that the band seems to be equating “grown-up” with “bland,” offering up a set of tunes that sound fine but are largely lacking in the vigor and charm of its earlier work. The title track is moderately catchy—albeit in a way that’s just begging to be made into a tourist jingle, or maybe a jeans commercial—but it’s full of generic Golden State clichés that feel more like forced shout-outs than genuinely felt appreciation. The California-boosting is repeated on the even more boilerplate “Let’s Go Home,” where Cosentino tells you, in case you missed it the first time, “I’ve seen all the mountains/I’ve seen all the trees/I’ve seen all the water/but nowhere compares to home.” That, plus the California-hugging bear on the cover, plus the band’s name—you just want say enough already. We get it. 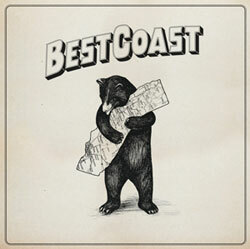 Best Coast can still write a great hook, and its simple rhymes, repetitive lines, and filler “oohs” work fine for two-minute songs channeling a beach-bum vibe, but the clearer production and slower pace of the new album emphasize how underdeveloped the band’s lyrics and song structures are. Song after song starts off strong, then loses its spark by killing clever lyrics or melodies with repetition. Rather than nods to the simple joy of classic pop songs, these tunes come off as boilerplate. The heavy guitars and vocal harmonies of “Last Year” sound great, for example, but other than a few choice lines—”What a year this day has been/what a day this year has been”—the lyrics offer little more than banal reflections. The one song I loved unabashedly was “Why I Cry,” whose brash tempo and jabbing lyrics presented a refreshing change from the lethargic meandering of too many other songs. So, it’s a pleasant enough album to have on in the background: blithe and bright, just kind of boring. Towards the end, on “Dreaming My Life Away,” Cosentino sings “We fell asleep” about five times in a row before ooh-ing and ahh-ing till the end of the song—which pretty much sums up the listening experience. This band is likable enough, but I miss the beach brat.